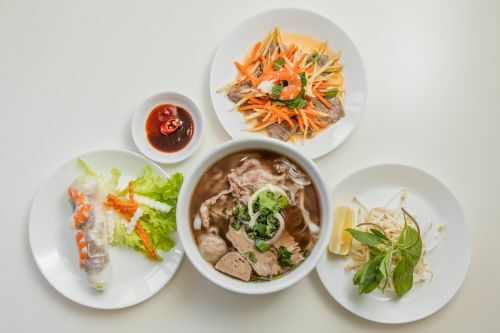 Menulog delivers for Lakeside Vietnamese Cuisine so you'll be able to track your courier on a map. Choice of beef (goi cuon bo) or prawn and pork (goi cuon). Choice of fish (canh ga chien nuoc mam) or tamarind (canh ga sot me) sauces. Choice of prawn and pork (goi du du tom thit) or crispy pork (goi du du heo gion). Choice of squid (goi muc) or beef (goi bo). Choice of salt and pepper (tom rang muoi) or tamarind sauce (tom rang me). Choice of green papaya salad (goi du du ca barramundi) or green mango salad (goi xoai ca barramundi). Choice of green papaya salad (goi du du ca salmon) or green mango salad (goi xoai ca salmon). Choice of crispy salt and pepper (cua lot rang muoi) or chilli tamarind (cua lot rang me). Choice of tamarind sauce (bo nam sot me) or plum sauce (bo nam sot xi muoi). Choice of chilli jam and basil herb (bo xao chilli jam), satay (bo xao satay), chilli and creamy coconut sambal sauce (bo xao sambal) and chilli and lemongrass (bo xao xa ot). Choice of satay (ga xao satay), chilli and creamy coconut sambal sauce (ga xao sambal), chilli and lemongrass (ga xao xa ot), chilli jam and basil herb (ga xao chilli jam) or cashew nut (ga xao hat dieu). Ga hap cai thuong hai. Choice of chilli and creamy coconut sambal sauce (truu xao sambal), chilli and lemongrass (truu xao sa ot), chilli jam and basil herb (truu chilli jam) or satay (truu xao satay). Choice of sweet and sour (suon heo xao chua ngot), salt and pepper (suon rang muoi) or caramelised (suon ram man). Heo xao sambal. With chilli and creamy coconut sambal sauce. Choice of chilli and creamy coconut sambal sauce (tom xao sambal), chilli jam and basil herb (tom xao chilli jam) or snow peas and shiitake mushroom (tom xao shiitake). Diep xao dau hoa lan. With ginger and shallots (ca barramundi hap gung hanh) or black bean sauce (ca barramundi sot tuong den). Ca salmon sot tuong den. Cai ro sot dau hao. Cai thuong hai xao xi dau toi. Cai thap cam xao dau hao. Bong cai xanh xao chilli jam. Cai thap cam xao chilli jam. Cai xao thap cam. With your choice of rice (com xao chay) or tofu (cai thap cam xao dau hu). Choice of egg noodle (mi xao chay), rice noodle (hu tieu xao chay) or vermicelli (bun xao chay). Bun dac biet. House special vermicelli with chargrilled marinated pork, fish cake and spring rolls. Pho. Upgrade rice noodle soup to large bowl extra $2.00. Pho tai and nam. Medium rare. Pho tai, nam and vien. Medium rare. Pho dac biet. Sliced medium rare beef. Brisket, beef ball and tripe. Choice of chicken (mi gion xao ga) or combination (mi gion xao thap cam). Choice of beef (mi gion xao bo) or seafood (mi gion xao hai san). Choice of chicken (mi ga xao satay) or beef (mi bo xao satay). Choice of chicken and vegetable (mi ga xao), beef and vegetable (mi boi xao), seafood and vegetable (mi xao hai san) or combination (mi xao thap cam). Choice of crispy chicken (mi ga da gion nuoc), seafood (mi hai san nuoc), pork chop (mi suon nuong), combination (mi thap cam nuoc). Choice of satay beef (hu tieu bo xao satay), satay chicken (hu tieu ga xao satay), seafood (hu tieu xao hai son) or combination (hu tieu xao thap cam). Hu tieu suon nuong nuoc. Choice of crispy chicken (hu tieu dai ga da gion nuoc), seafood (hu tieu dai hai san nuoc) or combination (hu tieu dai thap cam nuoc). Com chien ga ca man. Com chien ga hat dieu. Com do bo luc lac. Choice of mixed vegetables (com ga xao rau cai), chilli and lemongrass (com ga xao sa ot) or satay (com ga xao satay). Choice of mixed vegetables (com bo xao rau cai), chilli and lemongrass (com bo xao sa ot) or satay (com bo xao satay). Choice of mixed vegetables (com hai san xao rau cai), chilli and lemongrass (com hai san xao sa ot) or satay (com hai san xao satay). Com dac biet. With chargrilled marinated pork chop, fried egg and meatloaf. Lau tom yum hai san. Lau tom yum thap cam. With chargrilled or marinated chargrilled and your choice of minced prawn on sugar cane (banh hoi chao tom), beef in betel leaf (banh hoi bo la lot), beef (banh hoi bo nuong), pork (banh hoi heo nuong) or pork sausage (banh hoi nem nuong).